How Fast Did The Economy Grow? GDP Forecasts Are All Over The Place President Trump is eager to tout a fast-growing economy, boosted by the tax cuts he pushed through Congress. That makes Friday's report on gross domestic product a highly anticipated news event. 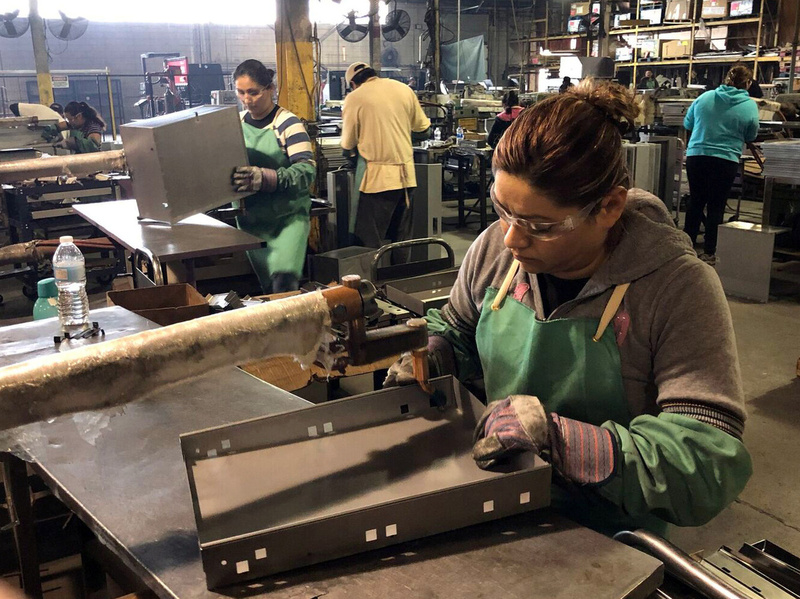 Workers weld drawers on the assembly line at the Metal Box International toolbox factory in Franklin Park, Ill. Many analysts estimate that U.S. economic growth picked up in the second quarter. The New York Federal Reserve Bank, for instance, uses a statistical model called the Nowcast to predict where the economy is going. Back-testing the model has shown that, had it been around in 2008, it would probably have predicted the Great Recession, giving Fed officials a bit more time to prepare for it, says New York Fed economist Andrea Tambalotti. In the back-testing, he says, "all the data turned negative quite quickly and quite abruptly. And the Nowcast picked that up. And when you see the Nowcast sort of plunging, you know that something is wrong." The Nowcast was once only released internally, but a couple years ago Fed officials began publishing it online. "We think that it's helpful for the public at large to see this number and understand what we do," Tambalotti says. As of this week, the Nowcast is predicting that the U.S. economy grew by a middling 2.7 percent during the second quarter. And then there's the Atlanta Fed's GDPNow. Like the others, it's compiled by crunching a lot of economic data, Atlanta Fed economist Pat Higgins says. "So it'll be things like retail sales, international trade, manufacturing shipments," he says. And right now the Atlanta Fed's number — a blockbuster GDP growth pace of 4.5 percent in the April-June quarter — is strikingly different than the New York Fed's. The 4.5 percent figure would be the fastest growth in nearly 4 years. If you like President Trump's policies, that's the estimate you quote right now. Donald Trump Jr. bragged about the Atlanta Fed numbers on Twitter. And Treasury Secretary Steven Mnuchin recently trumpeted the Atlanta number on CNBC. "We're expecting a big second-quarter GDP number," he said. Major banks and private firms put out their own numbers. The private Conference Board, best known for measuring leading economic indicators and consumer confidence, estimates GDP grew at a 4.2 percent rate in the second quarter. Obviously all of these numbers can't be accurate. But Tambalotti says these estimates shouldn't be looked at as competing. Instead, he says, they complement each other. "We together can have a better sense of is the economy doing well or is the economy not doing so well, which is what everybody in the end is really interested in," he says. Tambalotti says the economy is enormous and ultimately unmeasurable. All these forecasts should be seen as an imperfect baseline. Even the official GDP number released by the Commerce Department is intelligent speculation. And it will be updated as new data comes in, Higgins says. "The initial numbers are based on incomplete data, so a year or two from now the actual estimate could change a lot," he says. In fact, the government can come back after a few years and revise the numbers. There have been times when the U.S. economy was actually in recession and no one knew for sure until much later. Still, the GDP report that comes out Friday is the number that generates headlines and moves markets. Tambalotti calls the report the custodian of the true number. And in a sense that's the only number that matters. In the audio of this story, as well as in a previous Web version, we incorrectly say that the New York Federal Reserve Bank had used its Nowcast model to predict the 2008 financial crisis. In fact, the Nowcast was not created until after the Great Recession, but economists later determined that the model would have alerted them to the coming recession had it been used at the time.